Join the discussion on our forums! Come discuss Ultrasaur over in our dedicated Ultrasaur discussion topic. Will the big ole beast ever see play in a standard, ladder deck? The KING of Streamer Showdown. Dies to Meteor and Volcano, frighteningly accurate. Paladin: Any 5 mana combination of Crazed Alchemist / Kooky Chemist and Attack Buff spells depending on whether the health is still higher than the attack into Blessed Champion is a lot of damage. 10 mana. Neutral: Hozen Healer into Crazed Alchemist for 6 mana, go face for 14 damage. Available to all classes. Hunter: Neutral Combo into Crackling Razormaw aiming for Windfury or +3 Attack. 8 mana. Priest: Neutral combo with Inner Fire. 7 mana, with room for Power Word: Shield into Divine Spirit. Shaman: Neutral Combo into Windspeaker. 10 mana. Then consider the cheaper cost of hard removal and realize that while baiting hard removal with a Vanilla Stat Pile sounds great for your other minions, you are losing a huge chunk of tempo. An option in Arena most likely, as you could do worse, and it has the beast tag. I must be missing something, how is Hozen Healer into Crazed Alchemist 28 damage? You are correct, that should be 14 damage, not 28. Edited my post, thanks for pointing that out. Do you do this for all the filler cards? It was a nice read either way. 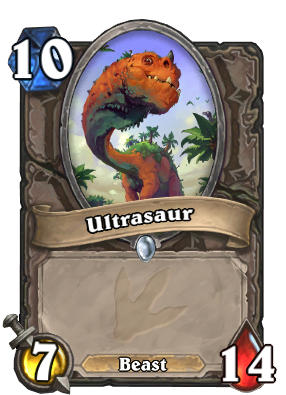 Nah, but I found Ultrasaur's stat line to be at least interesting enough to consider what you could do with it - which turns out to not be much since your opponent should just remove it for the tempo gain. It was fun to write up though, so thanks for reading.